"Captivating! Engrossing! Are you afraid to ‘die’? Missing a loved one? Curious about where they are? What they do, if anything? Chris and Jim Petosa bravely open their hearts with the help of gifted Spiritual Communicator, Medium and Grief Counselor Elizabeth Williams. Jim, communicating from another realm, and his wife share their grief, concern for family members and how they learn to live and grow without the other. We are witness to the remarkable transformation that can and does occur when we leave our bodies…or better yet, right now if we choose! Let the wisdom of Jim's reflections re-awaken your soul to Hope, Peace, Love and Joy." "This book offers encouragement for anyone who has ever loved and lost…or pondered the idea of something beyond ordinary existence. It is the story of a love that escapes the bounds of time and space and endures beyond the limits of both. Their [Chris and Jim's] fascinating story is a vision of hope for us all." "Grief from the loss of a loved one follows no timeline, nor is there only one way to get through it. 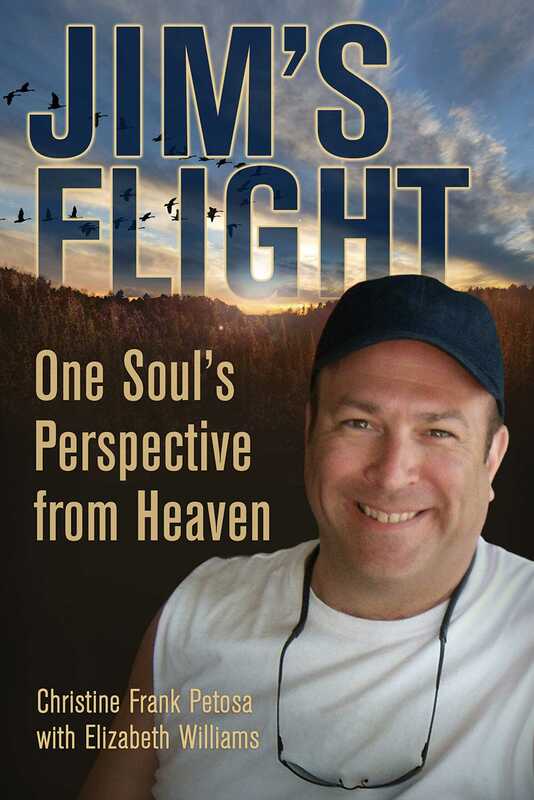 Chris Petosa’s book, 'Jim's Flight: One Soul’s Perspective from Heaven', takes the reader on a journey that touches upon all the elements of a full and meaningful life: love and loss, grief and faith, despair and hope, fear and courage and, in the end, death and healing. With the help of a gifted spiritual communicator, Elizabeth Williams, Chris breaks through the veil imposed by the physical world where death is the end, and enters into the metaphysical realm of the soul where death is just a new beginning. The reader discovers that even after death the soul learns, heals, loves, finds redemption and reconciliation, but most of all grows. This book is a must read for anyone bereaving and looking for something more than just the traditional formulaic solutions to dealing with grief and loss." "Jim’s final days and the courage, understanding and ultimate acceptance that he and Chris experienced is in itself a compelling story. Chris and Elizabeth have now taken this to another level. After reading the initial draft of their work I am truly amazed at the insight and clarity that defines their spiritual discoveries and beliefs. I feel as illuminated as when I first developed an interest in the afterlife as a teenager while reading "The Sleeping Prophet" by Edgar Cayce. If the purpose of our life's journey is to answer the age-old questions of 'Who are we? ', 'Why are we here?' and 'Where are we going after we die? ', then this book may provide such insight. This work could potentially be one of the premier books of that genre. It is an absolute must for anyone on that spiritual quest." "Is there life after death? Does Heaven really exist? Providing us with insight, wisdom and practical knowledge, we learn from Jim Petosa's flight to Heaven and back that life exists beyond the physical world. Written with the assistance of Elizabeth Williams (who is a light worker and third generation Catholic Mystic, known in modern terms as a Modern Day Mystic) 'Jim's Flight: One Soul's Perspective from Heaven' is a compilation of the journey of Jim's transition to Heaven, his wife's experience as the caretaker, and the portal to expand humanity's understanding of it all. Riveting moments capture the reader, open the hearts of many and, truth be told, enlighten all of us to believe that the soul lives on forever. While very highly recommended and certain to be an enduringly popular addition to community and academic library Metaphysical Studies collections." "An extraordinary and deftly presented account that is a 'must read' for anyone who has ever desired to explore the question of a continuation of human life after death. A consistently compelling and thought-provoking presentation, 'Jim's Flight: One Soul's Perspective from Heaven' is very highly recommended for both community and academic library Metaphysical Studies collection."